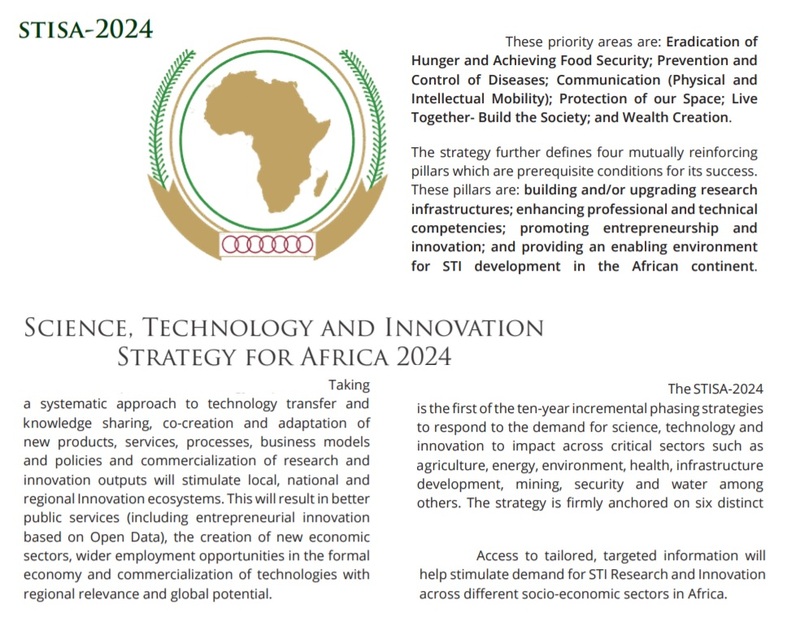 (3) Science, Technology and Innovation Strategy for Africa (STISA-2024) approved by African Heads of State in April 2014. These strategies will also contribute immensely to achieving the global Sustainable Development Goals (SDGs) and the creation of long-term economic benefits for the continent and beyond. It is recognised that the long-term success in achieving these priorities will depend upon increased rates of wealth creation in Africa and its states. The African Open Science Platform (AOSP) was launched in 2016 as the Africa-wide initiative to exploit the potential and promote the value of Open Data for Open Science. By sharing news on Open Science and Open Data-related events, as well as knowledge on the development and coordination of Data Policies, Data Training and Data Infrastructure, - AOSP boosts the impact of Open Data for Science and Society on the African continent and beyond. 2.) by creating programmes targeted at key priorities, to stimulate pan-African collaboration, facilitation of relevant data access, and provision of high level technical support. Take a look at CODATA Media Release African Open Science Platform to boost the impact of open data for science and society. Actually, AGORA offers up to 13,700 key journals and 26,900 e-books from some 185 publisher partners providing full-texts to more than 3,400 institutions in more than 115 countries. With a focus on improving access to knowledge and its sharing, Research4Life provides access to quality scientific research to deliver knowledge to the world’s poorest countries, including a number of countries in African continent. The concept is simple: research in health, agriculture, law, the environment, innovation and development is better informed when it is based on the most recent, high quality and relevant scientific knowledge. Users at registered institutions (see: Types of eligible institutions) from Research4Life eligible countries : Group A, Group B, can access to the Research4Life content (see: Using the Research4Life portals). To REGISTER with the AGORA programme kindly click here. NOTE: an individual cannot register to R4L. Registration is institutional and restricted to eligibility of the country and type of institution. !!! Free AGORA e-Course February 2019 Edition. Call for Applications - REGISTER NOW! (Deadline for applications: 27 January 2019) !!! - IST-Africa Guide to 2018 Calls for Proposals in Horizon 2020provides an overview of Calls, themes and deadlines during 2018 within the Marie Curie, eInfrastructures, Leadership in Enabling and Industrial Technologies (LEIT) and each of the Societal Challenges (Health, Food Security and Agriculture, Energy, Transport, Environment, Inclusive and Reflective Societies, Secure Societies) Work Programmes. You are welcome to Sign up for AIMS News, and to follow @AIMS_Community on Twitter... And, thanks again for your interest !